It’s a kind-of-true telling of the incident. I don't see Giselle as having a lot of artistic ability, so I chose to reflect that in her "flashback style". Are you freaking kidding me? Has that kid learned absolutely nothing? Yes, Amanda was jealous at Heather’s newfound happiness and she perceived that as bragging, but she hit her because of the betrayal, not the freaking stuff Heather had! Omg Heather I swear if you don’t tell the truth here… you are just as bad as Amanda is for hitting. … right, I had forgotten Giselle is one of the little bongos who hates the orphans. Even if the betrayal doesn’t come up, there’s still a bit more detail here that Kenneth might be interested in learning: “jealous” = “Heather has parents and Amanda doesn’t”. As far as I can tell, he doesn’t yet know that Amanda used to be in the orphanage. And if it comes out that Amanda now has two BIOLOGICAL parents that she didn’t even know about at the time of the hitting incident, then we’re getting pretty close to the “family secret”. What I would really like to see, if not now then soon, is for Selkie to come into this with the truth, becasue Amanda is her “sister” now. But does Selkie know “the truth” at this point? I think she is missing some rather large bits of it. 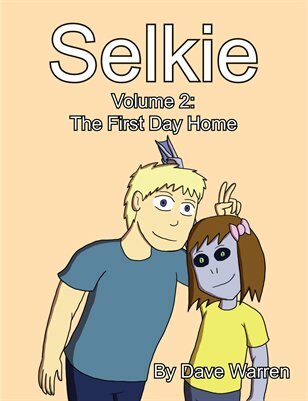 Why would Selkie want to? She´s had nothing but hatred and abuse from Amanda for three solid years, and all the adults are like “Amanda´s your sister now, you gotta get along with her” while ignoring that Amanda has no intention at all to no longer pile abuse on Selkie. From Selkie´s point of view, anything that leads to Amanda being read the riot act, and might thus lead to her being *forced* to change her ways, is a good thing. She might want to help Heather. 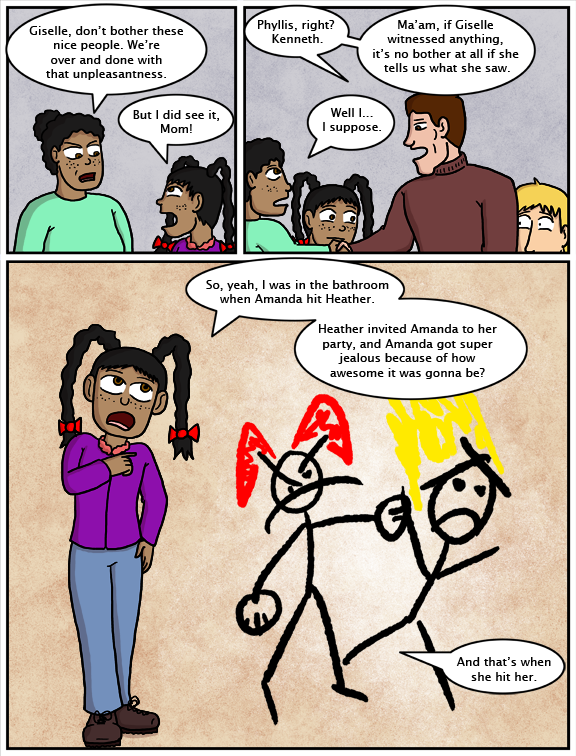 There’s this factor: https://selkiecomic.com/comic/selkie413/ So, she’s likely to guess that Amanda’s anger wasn’t just about the party. But I don’t think Selkie’s even in the room any more. On the previous page, that little group in the distance looks like Selkie, Todd, Amanda, and Andi, all leaving the show together. So what happens when she gets a chance to say something about this is going to depend a lot on what else has happened in the meantime. It just hit me. Maybe part of why Heather isn’t telling her dad the real reason why Amanda hit her is to protect what’s left of Amanda’s secret. “What was the secret, honey? Yeah, that’s the obvious solution, but it might be Heather doesn’t realize that’s an option. Many *adults* don’t realize that sort of thing is an option. Too often people (including me) accidentally assume that the only options are total secrecy and telling everything. Heather may be able to add that it wasn’t jealousy of the party, but jealousy over her getting adopted when they all promised to be adopted together. That wasn’t the main reason Amanda was mad at that moment, but it was a catalyst for everything that went down. Amanda’s secret won’t get out anymore than it already has, and everyone has a slightly better understanding. She should probably confess she told A secret. She was honestly trying to help Selkie, so I won’t hold it against her harshly. Now that I’m looking back at those previous pages of the aftermath, I feel that they might be able to end some of the animosity. Their friendship is long gone, but I think that the anger can be quelled. Amanda didn’t like that Giselle and Lynni were lying to Heather and taking advantage of her, even if she was angry at her. She even still referred to Heather as her friend. Amanda might forgive her when she learns Heather felt bad about it, even if Heather doesn’t feel like forgiving her for all that she did. Looking at everything here, I really feel for Keisha. I’ve had a friend group split because of reasons of mistrust and bits of drama, and yet I am in that awkward neutral zone of someone who is still friends with everyone, but knows that the rift has little to no chance of mending. It hurts, but there is no point trying to open old wounds to fix it. It’s close to the truth. As far as she knows. Amanda has probably had to deal with a lot of Heathers and Kenneths in her life. People who peg her as a bad child immediately and people who omit the whole truth of why she lashed out in anger or fear. As I’ve said before, adults have failed her. Everyone always assumes she’s 100% in the wrong which probably attributes a lot to her actually going and causing trouble. “Yeah, I’m the bad kid. I’m awful and terrible.” THAT is a very telling statement. Amanda has been designated a roll that she feels like it’s hopeless trying to avoid. She’s the bad kid. She’s always the bad kid. Even when she’s not the bad kid. So why even try being the good kid? *She’s the bad kid. She’s always the bad kid. Even when she’s not the bad kid. So why even try being the good kid? * This was me in a nutshell growing up always in trouble for something but it was never for hurting other people. Even after I gave up trying and often ditched school mid class (literally just got up and walked out) I never did anything to hurt other people. So that why even if I can understand that feeling so very well I still wont give her any slack for how she chooses to lash out at others. Yeah I get the feeling I *know* the feeling. She is still hurting other people *intentionally* hurting them both physically and mentally. She plans this crap out and takes actions for the sole reason that she knows it will hurt them. I don’t care if she has given up on being good, that is not the same as deciding to be cruel. And Amanda has taken stock of her situation and chosen again and again taken joy by making others hurt. But did you have parents? Did you have someone who cared about you and listened to your problems? Did you cut class when you were 9? Yeah. Now think of Amanda. Literally no one. Also she’s 9 with basically no role model. I think Amanda is only 8, not 9. Which strengthens your point! She is way too young for people to write her off. She needs support and guidance, not blame. Even coming from what looks like an okay family, children that young can be cruel for far more trivial reasons than Amanda ever had. They discover that wielding power feels good. Empathy is not automatic. …and, on the very next page after this one, Giselle proves that she’s learned something.